The first three-cone event of this year took place in Moscow. Adrenalin skatepark opened its doors for all the skaters from all over the world, just like last years, for the first big competition of 2012. 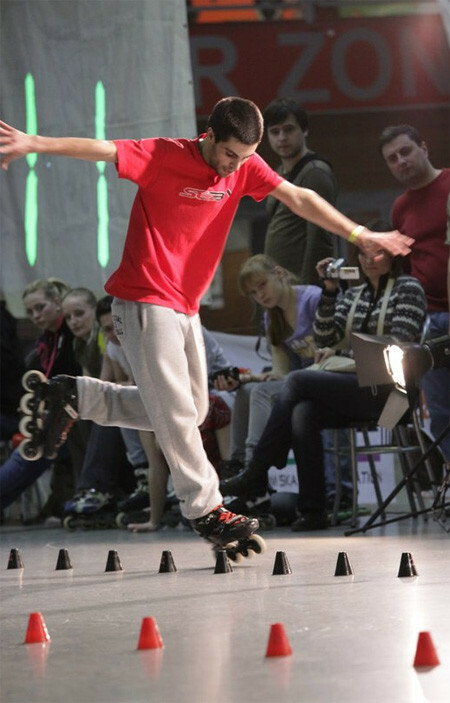 The event, entitled Rollerclub Cup, included all the disciplines of freestyle: speed slalom, battle and also classic and slides. The event was transformed into a multi-discipline tournament rewarding the most flexible skater. 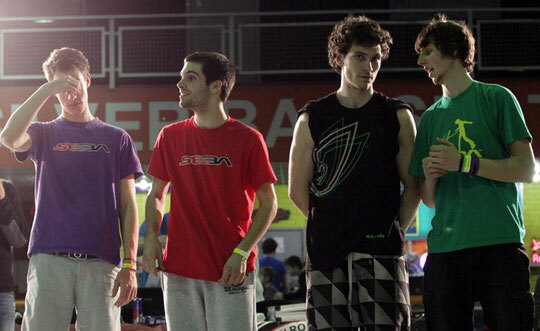 The one who had the best results in most disciplines would win the Rollerclub Cup in the end. There was also an unannounced category, that of the best last trick during the battle finals, which was quite an interesting idea. The competition was scheduled on three days: Friday, Saturday and Sunday March 16-17-18, 2012. 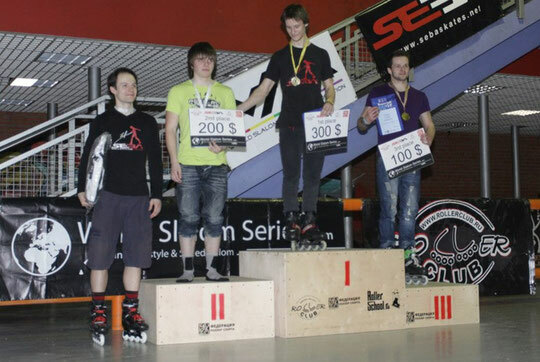 On Friday, it was Speed Slalom and Slides, on Saturday, Men’s battle qualifications and Classic, and on Sunday, Battles. 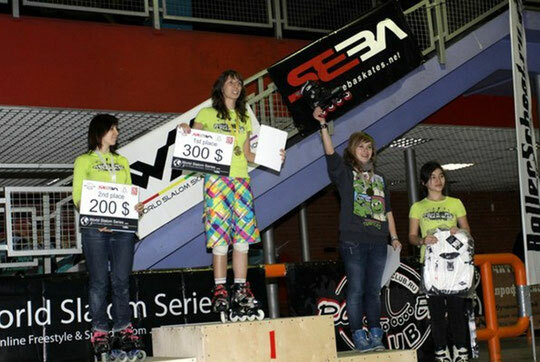 The Rollerclub cup 2012 was as successful as the 2011 edition: There were nearly a hundred people registered. The Russian team, in addition to all the permanent members, was present with a lot of new skaters, including kids, for all the disciplines: you could see many new faces at the speed, slalom and slides competitions. The most distinguished skaters were more than a lot! Lysenko Kristina easily won the Speed Slalom Contest and did a very original classic run, which only got the eighth place but it will be better with time for sure! She also got the eighth place for battle at the consolation final, the fight against all those crazy strong girls was tough. Meleshkevich Viktor got the bronze medal for Classic and Silver for Battle. Gordin Roman got two fifth places for Classic and Battle as well as the special prize for the best last trick. The new generation, kids Semenikhina Olga and Kuznetsova Daria, were really impressive! Semenikhina Olga won the third place for Classic and ended up sixth in Battle – which is a great result remembering with whom she was competing. Kuznetsova Daria was the star of the whole competition: she won both Classic and Battle! She showed the best results competing with the strongest skaters and she was a good example, doing everything with ease, no stress, staying positive and just doing her best, bravo! For slides, the two winners were Russians too: Sukhenko Ilya and Krykova Natalia did their best to be on the first steps of the podiums. Babiy Anzhelika, after the trauma, competed only for Battle but still showed a good result with a fourth place thanks to crazy wheeling footgun tricks. Her back wheeling footgun won the best last trick special prize. Unfortunately for Shitov Andrey, who was fourth for Speed, he couldn’t do his best for Classic and Battle. But if it's just the first big event of the year, it will be better for him next time for sure. Two more competitors saw their skating bridled by their emotions. Although Polina Semenova qualified for the final at the Battle, she could have done much better than she did. Anyway she got the third place. She didn’t do badly for classic either, getting the fourth place just behind very strong girls.Kulagina Yulia, who impressed everyone during her warm-ups, got only the seventh place for Battle. But in fact she has become very, very strong now, and the day she will be able to be stronger than her emotions she will probably be on all the podiums. As for the foreign skaters, there were many competitors from France, Germany, Spain, Poland, Italy, Ukraine, Belorussia and even Australia! The most numerous international team was France. Igor Cheremetieff did his best to be on the podium for Classic and did a good performance in battle too. Alexandre Claris was good everywhere, and particularly in Speed and Battle where he got two bronze medals. Hervé Guillou took part in all the disciplines and managed to be in the Top 10 almost all the time. Zoé Granjon won the bronze medal for Speed and did quite a good run for Classic as well as a good performance in Battle too. And “least but not last”, the Rollerclub Cub winner, gold medalist for Battle and Classic, and far from being outdone in Speed too, Romain Lebois. The second big team was Germany. Artur Grigoryan, Maria Eggert and Falcini Pascal from Cologne took part in the Speed and Battle competitions.Ziertmann Anya competed in Speed and Battle with quite a good, fast and technically hard classic run. Florian Schneider showed good results in Speed, Classic and Battle. And Martin Sloboda still keeps a good level gets two nice fourth places for Classic and Battle. Spain was well represented by Jon Larrucea for Speed and Classic. Let’s note his great performance during the consolation final for the Battle which owed him the sixth place at the final ranking. Poland was represented by Klaudia Hartmanis who was really impressive! She got the sixth place for Classic and highly deserved her two second places for Speed and Battle. Klaudia is the winner of the Rollerclub Cub as the most flexible female skater. The Italian skater Simone Nai Oleari, the only representative of his country, easily won the Speed Slalom and got excellent results in this competition. The brightest representative of Ukraine, Marina Boyko, ended up seventh in Speed and did quite a good Classic run which led her to the second place of the podium just behind the young representative of Russia, Kuznetsova Daria. Unfortunately, her skating at the Battle was not as good as during Classic: she ended up fifth only, but you could easily see that the problem came from her emotions, not from her level. Let’s hope that next time she will be able to show all the great tricks she’s got in stock. Komarchuk Kseniia did well too, with a fourth place in Speed and ninth places in both Battle and Classic. By the way, her classic run was as usual very original and musical. It was not yet perfect but no doubt it will improve with time! There were also many slide skaters from Ukraine, including Konstantin Moshak whose video you can check on sebanews.com. Alex Shulhan represented Belorussia with his friends, competing for Speed, Battle and Classic. Eighth for Speed and twelfth for Classic, and good job in Battle – competing at the consolation final and getting the eighth place, which was not a piece of cake. Australia was represented by Natalie Ujuk who did quite well in Speed, Classic and Battle. 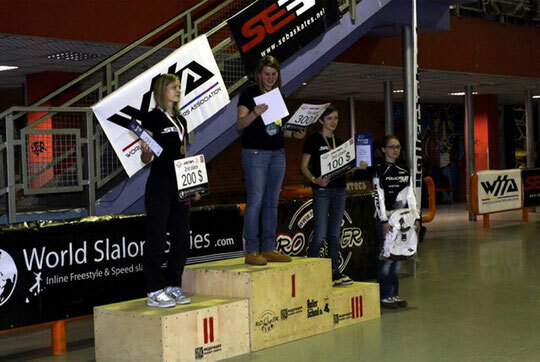 Kristina Lysenko (Rus): “I'm so happy to have won the speed slalom with such a strong girl company. It was not a technical victory but my own victory of skills over stress. Change was on my side and I could get through my stress. The hardest competition I've ever taken part was in Geisingen for the World Championship :) (Girls, thank you for such a good experience. This competition was for stress, as I've already said. Simone Nai Oleari (Ita): “Of course I'm happy to have won because it was my first competition of the season and I was worried about the result. There were very strong French and Russian guys! Plus I have new skates and it takes time to get used to them. But finally I was strong enough to win and everything was fine. I trained a lot with my Italian friends who are very fast. It’s very effective to skate with them. There were many good skaters and I’m very happy to win. Next stop for me will be Korea and I hope to continue this way. Natalia Krykova (Rus): “The level of the women sliders is improving all the time, especially here in Moscow. That's why I trained hard for the Rollerclub Cup, but unfortunately I was still too stressed to do my best. But anyway I’m very happy to have won, of course! At the end of May, all our slide team is going to Paris. I really like the PSWС atmosphere: it's more like a show, not just an ordinary competition. And there is always huge support from the public. First, I would like to thank my opponents: you don't let me relax. And special thanks to ReKiL for helping to organize the competition. And big thanks to Rollerclub and all the people who helped and made these great weekend such a success! Sukhenko Ilya (Rus): “When I heard that I was first, it was so emotional, just like a bomb! In fact, slide competitions are quite easy: You just have to do 5 slides and wait for the judges’ decision. Last year, I was third and it was already pretty good for me. 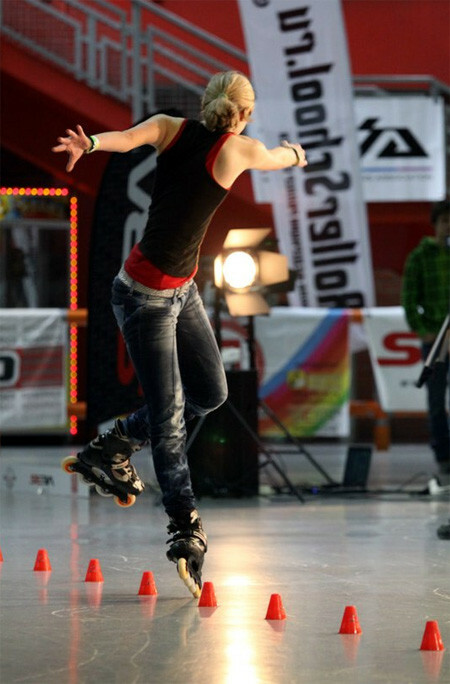 This year, I was training during my free times in-between the lessons for the Roller School (I work as an instructor). Skate cross is easier to compete for me. There are only two ways: either you do good and fast and you win, or you make mistakes and you lose. In slides you can still change the situation and make up for your mistakes. I like speed slalom also, it's so cool! Maybe I’ll start to train speed slalom seriously. The competition was great! I particularly liked Igor’s skating!!! So stylish and full of energy! Thanks to Rollerclub, WSSA and SEBA Skates for this great season opening! Romain Lebois (Fra): “I wasn't actually ready for classic; I started to prepare my run just 2 weeks before Battle Moscow. So it was just a shock for me to get the first place. But when it was time for my run I gave all I could, I was with the song and I did all my best. Igor and Viktor did good classic runs too, fast, technique, with the song, good job to them. The organization was really good, the floor was good too, just thanks to all the people who made it for us. I think I will keep my run for the next competition because I like it. I really feel good with this one! *Special nomination for the best last trick: Lika Babiy (Rus). P. Dasha, you won both Classic and Battle. Which one was the hardest to get? Do you have any secrets to stay cool during competitions? Because you're the only girl who managed to do everything clean and with ease. Anyway good job, keep skating and see you next time! P. Lika, you won the special prize for the best last trick. Did you expect that? How long did you train your wheeling footguns? You can do front, back and christie now, can you imagine what’s next? Transitions? Are you going to try to create something new? L. “No, I didn't expect to get this prize but it was a nice surprise. Usually, it's hard to push yourself to train something really hard which no one is training, but I have always liked it. Thanks Rollerclub for this prize: now there’s not only the interest in training on something almost impossible but also a good motivation! Now I like practicing wheeling footgun spin to the internal side going forward: the feelings are so cool when you turn, find the balance and try to come back for the next turn!!! I also dream about doing a few lines of back wheeling footgun as a last trick, if I find enough free time to train it of course. P. So you won everything this time! What was the most difficult to win, Classic or Battle? What do you think about the level at the Battle final? Did you expect to win? Who was your most dangerous opponent? R. “Yes, I won classic and battle this time. Actually I did expect to win the battle but I wasn't ready with the floor... The floor was too slippery and before my good runs, I had done a bad warm-up and a bad first round, but in the end I was really ready, the music was good, the Seba Team and Ksenija my girlfriend were on my back. P. You've got the special prize for the best trick, well done! How long did you train for that one? I really liked your attempt at sitting cobra to wheeling christie. That must be hard! Will you try to do wheeling christie at the next event? What are you feelings about the competition? Romain Lebois (Fra): “This kind of competition is great: it shows who is strong in all the disciplines. I'm really happy to have this cup because it means that I did a good job and trained well before coming to Moscow. Now I would like to do the same with the Chinese guys (joke). I will do all my best to have the same level as theirs and to prove that Europeans are strong too. Klaudia Hartmanis (Pol): “How do I feel? I'm really really happy!!! I'm also very satisfied because after my hard training I did a nice performance and I had a lot of fun. As always, I met great people too!!! This competition motivated me even more and I can see better what I should improve, change or just train. I'm very proud of my results. I got my new record in speed slalom :)) It was the second time I managed to reach the final on such a big event. My Classic could have been better but I'm going to practice it more for the next competition (I had no space to train on my whole classic run but now that spring is coming, I'll have enough space. All I need is a sunny weather haha). I liked the competition so much!! It was unforgettable and I hope I will visit you in Moscow next year again. I'd like to thank the organizers of this great event and Seba to enable me to go to Moscow. I also thank Igor, Herve, Romain, Jon and Alex for the cool time spent together and for their support :)) and of course huge THANKS to all the skaters! Some more feedbacks from the skaters. Larrucea Jon (Esp): “This was my first time in Moscow and my first competition of the season after my Erasmus in Denmark. The first memory I have of Moscow is the arrival at the airport and ten guys offering a taxi, one after the other. Then I remember the extreme cold entering the parking, the apartment and, of course, the food. I love Russian food, soups, fish, vegetables… it is interesting to see how diets adapt to the different situations and cultures. The environment in the sports center was great. Everybody was having fun and enjoying the competition. The organization did a nice job with the meals, transportation, cameras, and with the improvised tour around the emblematic places. During the competition, I don’t know why exactly but I couldn’t do my best. Before coming, I expected to be in the final but after Friday, I already knew that it would be difficult. Maybe I am not used to have a main event as the first event of the season. The travel culminated with a fantastic after party to say “see you soon” (I don’t like good-byes) to everyone and take the plane early in the morning. 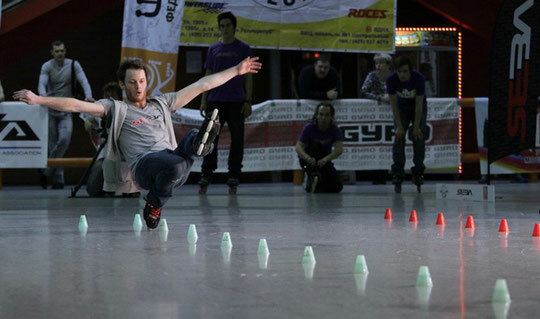 Alexandre Claris (Fra): “It was my second participation to the RollerClub Cup, so I already knew what to expect. It was great to see all my friends skating for such a big competition; they are always so nice, helpful and friendly! The level has increased significantly and many of us could think about winning. 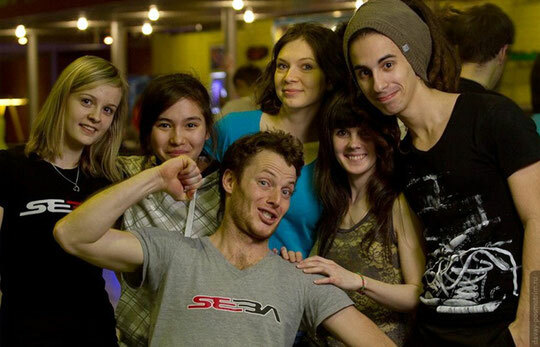 I'm very happy about this competition and I'm looking forward to coming to Moscow for the 2013 RollerClub Cup!